Hi on the weekend I drove down to the Growers Market in Bellingen at the showground. Bellingen is about an hour south from here in Nana Glen. The Energy Festival was also on- this is an annual event now in its 6th year. 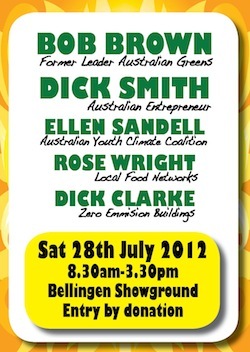 I’ll definitely be there next year sharing some green energy through green smoothies! I saw lots of leafy greens plus ex Greens Senator Bob Brown who once lived in this area. He spoke to about 300 people on politics and green energy and how a change was coming and people were starting to vote differently. He believes we are the only ones who have the power to start pushing for and implementing change for more solar green power in this sun rich land. He quoted Socrates “I am not an Athenian or a Greek, but a citizen of the world.” and reminded us that we are all citizens of the world regardless of nationality eg Chinese, Afghani, Indian or Australian. He believes the choice is to be divided or come together and be undivided. We need to get to the point as a nation that we don’t let things like for example the giant fossil fuel generating old technology Kimberley gas plant happen in this sun rich nation. He got a laugh when he said that the LIberal policy consisted of one word-No! Bob recollected that his father, a policeman, once locked Bob up at 6 for not eating his spinach! Socrates was a contemporary of Hippocrates who is considered the father of medicine and is most famous for saying Let food be thy medicine and medicine thy food. Green food power! Rocket, parsley, kale, coriander, bok choy were some of the great greens for sale and of course yummy locally grown fruit. I loved meeting people from the Coffs Community Garden and the Coffs Regional Producers Organisation tables and lined up green smoothie workshops and articles! I also met a local permaculture expert, a local grower who has Synchronicity Farm a few kms from here in the Orara Valley. Go the greens! Hey there this is a wonderful blog site I can’t wait to return and read more.